Freeport, Bahamas - Mark your calendar of a great family activity and important fundraiser for the 2nd Annual BASRA Easter Egg Hunt presented by the Grand Bahama branch of the Bahamas Air Sea Rescue Association (BASRA) set for Easter Monday, April 9, 2012 from 1:00pm until 6:00pm out at Banana Bay Beach between Fortune Cay and Banana Bay. Same Location as last year, just past Fortune Cay before you get to Banana Bay Restaurant. Great fun and over $3,000 in Prizes! On January 30, 2012 at approximately 5:18am BASRA GB Base received a call from Police control that a 26 foot center console with (6) six persons on board was stranded off of West End. The call came in from a concerned citizen in Nassau whom received an original call from the boat and that the cell phone on board had gone dead. Freeport, Bahamas - On October 28th Red Beard's Pub hosted the second annual BASRA Halloween Bash Costume Party to support the vital non-profit group that protects us in the surrounding waters off Grand Bahama. 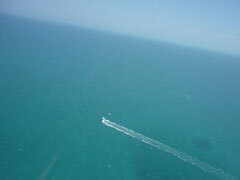 Entrance fees went entirely to the Bahama Air Sea Rescue Association (Grand Bahama Unit). Ghouls to princesses, angels to aliens, they they were all out to support the cause and have fun on a night when anything goes! The signature costume, the "pirate" was most prevalent. "BASRA Grand Bahama is pleased to once again be the recipient of Red Beard's Pub Charity Halloween Party, said Justin Snisky of BASRA. "It is because of people like Brian Bothom and his wife at Red Beard's that BASRA is able to stay afloat in this harsh economy. 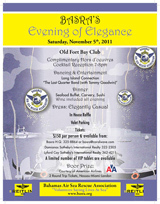 Their donation will be go towards our search and rescue efforts, and..."
Nassau, Bahamas - Bahamas Air Sea Rescue Association ( BASRA) presents their annual "Evening of Elegance" to be held on Saturday, November 5th at Old Fort Bay Club starting at 7pm. Please support this important fundraiser. Grand Bahama, Bahamas - For the month of July, BASRA had a total of 15 calls, 33 people assisted, 3 rescue boats called out, 2 plane searches, 3 assist from the USCG, 2 assist from RBDF, 5 commercial assists and 4 assists by good Samaritans. For the month of August, BASRA had a total of 6 calls, 5 people assisted, 1 rescue boats called out, 1 plane search, 1 assist from USCG, 1 assist from RBDF and marine patrol, 0 commercial assists and 1 assist by Good Samaritan. The following is there July and August, 2011 Report. 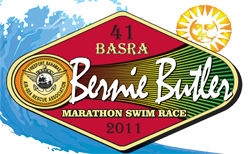 Freeport, Grand Bahama - The countdown is on for the 41st BASRA Bernie Butler Swim Race! The Swim race starts at 10 am, Saturday, August 20th and the after-party gets going from 12noon until... This year's theme for the tent decorating contest is SHIPWRECK. There will be plenty of Sands, Woody's and WKD on sale. Along with Antoni's pizza and hamburgers and hotdogs. 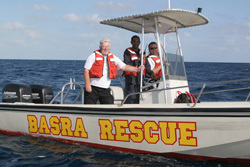 Freeport, Grand Bahama - Over night Bahamas Air Sea and Rescue Association (BASRA) handled two cases. 1) 11:00 PM, July 17th a call from Hope Town Abaco that a 60 foot troller had broke mooring and washed into a dock at Lovers quarters. BASRA GB called BASRA Hope Town to assist. Winds report in excess of 40 MPH. Case 2) 12:42 AM call from Obat that they received a Saturday phone call that a pleasure craft Patchy Fog had set off an E-Pirb and were aground with 4 people on board (2 adults and 2 children) and were 12 miles south of Grand Cay. 1:25 AM boat is at anchor and ok until morning. 6:45 AM boat needs assistance, Ocean rescue and Recovery responding. Freeport, Bahamas - BASRA Grand Bahama will host a Boating Safety Information Meeting open to all on Wednesday, June 22nd at the Hawksbill Yacht Club (Behind Cove House) at 7pm. Freeport, Bahamas - Since 1960 the Bahamas Air Sea Rescue Association of Grand Bahama made its mandate to save persons in distress on the sea. Solely manned and operated by volunteers, BASRA has saved many lives and been involved in thousands of rescues. With the assistance of both the Bahamas Defense Force and the U.S. Coast Guard, BASRA Grand Bahama maintains a watchful eye on the Northern Bahamas seas. Freeport, Bahamas - The 1st annual BASRA Easter Egg Hunt will take place on Monday, April 25th at Banana Bay Beach from 10am to 1pm. Easter Egg hunting for the entire family while you support the Bahamas Air Sea and Rescue Association (BASRA) of Grand Bahama! Bahamas Air Sea and Rescue Association (BASRA) Grand Bahama received a call via cell phone from a concerned parent reporting that his son and friends went out conching on board a 17 foot Boston Whaler and had not returned as yet. The Vessel departed West End, Grand Bahama on Tuesday, April 12, 2011 at approx 0800 hours. They were due in around 1600 (4pm) and failed to show. Grand Bahama Island - The 40th Annual Bernie Butler BASRA Swim Marathon and Beach Party took place on August 21st at Coral Beach in Freeport. Each summer the Bahamas Air Sea Rescue Association organizes this family favourite to raise funds. This year was deemed by those in attendance, and from organizers, as the best ever! See PHOTOS of the event within. Maya Albury of Freeport came out 1st overall for the women, and Dustin Tynes, also of Freeport came out 1st overall for the men. For the month of June, Bahamas Air Sea Rescue Association (BASRA) had a total of 13 calls, 22 people assisted - 5 people injured, 6 rescue boats called out, 3 assist from USCG, 2 assist from RBDF, 4 commercial assists, and 2 assists by others. Bimini, Bahamas - Friday morning Basra received reports of a vessel missing, the vessel left Dover sound Thursday 19 ft Boston whaler 200 Yamaha , two people on board . Talbert Johnston and Eliss Pinder, they were heading north to fish the banks or carters key area. Freeport, Bahamas - On Saturday, April 17th at 9:00pm police received a 911 emergency call from Frank Outten the owner of Franks Ice Cream. His boat had capsized only 100 yards off shore in front of Our Lucaya resort. Frank Outten and his passenger Steven Henfres were clinging to the side of the capsized boat. The pair were unable to swim to shore as they were tangled up in the fishing lines. Frank had a waterproof cell phone and was able to contact the police who in turn forwarded the information to BASRA. Immediately 2 rescue boats were launched into the area . Gary Simmons rushed out with his boat and BASRA chairman Jamie Rose also had a boat ready to go close to Our Lucaya. Police forwarded Outten's call to the BASRA base Search and Rescue Captain, Tom Christian, who talked to Outten, informing him of progress, and calming him while he was in the water clinging to his boat. Freeport, Bahamas - On March 31, 2010, BASRA held its annual general meeting. The past board reported a lower number of rescues due to the slower economy and cold weather. We answered 60 rescue calls , many resulting in at sea rescues, over 90 persons assisted with air/ boat search, commercial tow or only using VHF radios to find the boat and assist with local good Samaritans helping. There were three deaths in an airplane crash in Bimini.